An interview with Bernadette Devlin McAliskey, by Patricia Devlin of the Mid-Ulster Mail. Little has changed in the 40 years since Bernadette Devlin McAliskey took her seat in Westminster. There’s been progress, she says, the token gestures, the handshake. In 1969 the 21 year-old was thrust onto the main political stage when she took up her role as Mid-Ulster’s Member of Parliament. It was a revolutionary victory, not only for the young Queen’s psychology student, but for civil rights, socialism, nationalism and women, across the Province. Never before had a female firebrand as young, passionate and sincere as Devlin taken up a seat in the Houses of Parliament. Many say there has not been one since. In the by-election which saw the Unity candidate take over 53 per cent of the vote against unionist Anna Forrest; 91.5 per cent of the Mid-Ulster population queued at the polls. She remains the youngest woman ever to have been elected to parliament. “It was like something you would see now in other parts of the world,” she recalls. “And when I look back on it, people have different reasons for doing what they do, but at the end of the day all the candidate can do is set out the election manifesto and say: ‘‘If you elect me this is what I will do’,’ and I set mine out very clearly and I stuck by it. Delved into detail or not, the substantive of Devlin’s manifesto was unmissable. It called for the cancelling of the national debt, more jobs and more social housing, a challenge to sectarianism and an end to segregated education. “It is a wee bit sad for me that those issues were all live issues for me when I stood for the Mid-Ulster election in 1969,” she says. Today Mrs McAliskey sits, not only as the co-founder of the South Tyrone Empowerment Programme (STEPs), but as its project co-ordinator. Over 15 years the project, a first of its kind in the area, spread its wings across Mid-Ulster and now holds three offices, employs 32 staff, and caters to an ever growing list of those seeking help, from single mothers to migrant workers. Her role today maybe a far cry from the socialist female politician that shook the Wilson government, caused unease among Tory MPs and saw her serve a jail sentence for her radical left wing approach to politics, it is clear her values and core beliefs remain the same. She still believes that prisoners here are created and treated unfairly; she still believes sectarianism is institutionalised in our political structure and she still believes that democracy is threatened by those who hinder the right to say ‘no’. “People say ‘well you’ve made good progress’, yes, we have, and nobody would deny that. “We have made good relationship progress but because we haven’t made a good structural process, the relationships now begin to look a bit tatty and orchestrated because they have no substance in moving things forward. “That’s not to demean those things, but they have to be representations of something real, not substitutes for something real and to my mind they are substitutes for something real. “Because meanwhile back at the ranch, at Stormont, we have no racial equality strategy agreed, we have no cohesion, sharing and integration strategy agreed; we cannot get nationalism and unionism to move forward with the Review of Public Administration and give authority back to the councils. “We have no real change in education because the same jockeying for position of the two big blocks is going on. On local government, on health and well being, on more democratic participation, is all not happening. “We have no Bill of Rights which was to underpin the human rights; we have no civic forum, two big pillars in the Good Friday Agreement structure - never to be seen, disappeared. “The civic forum was to provide some sort of check-in-balance against that pillars of nationalism and unionism being erected. Dissidents, the founding member of People’s Democracy states, is a word synonymous with the “rump of the militarist republican movement”, but in the democratic sense: “I think that makes it necessary for democrats to be dissidents, if I can say that carefully. “There is a legitimate need, and a legitimate right of dissidents, to say this isn’t working,” she says. “To claim back for participative politics for democratic politics, to claim part the right of dissent from the configuration that a dissent threatens the peace, that dissent threatens democracy. The right to say ‘no’ is the fundamental right to democracy”. From 1969 to 1974 that fight for democracy, for rights, for fair governance, instilled the 21 year-old as a figure not to be messed with. Her time in Parliament is best remembered for her 1972 crossing of the floor of the House to punch Secretary of State, Reginald Maulding, who said the security forces “shot in defence” on Bloody Sunday - a day of bloodshed she witnessed. “My only regret is that I didn’t hit him harder,” she smiled. She was banned from the House for six months, and refused to apologise. “The single biggest thing for me in Westminister was nothing that happened in parliament, which is funny I am not an abstentionist,” reflects Bernadette. “What it did do for me, I think, firstly it created that platform which was like both platform and a mega phone, that brought Northern Ireland onto that stage and partly that had to do with what people would now call the brand. “I was 21, long haired, shirt skirted, big eyed and big mouthed, and I was a phenomenon. “So once I was elected to Westminster that was not only amplified onto the Westminster stage, but onto the world stage, and I was a media product. “The one thing I did learn is you can’t take this away from me, once this was there - it’s a bit like innocence, it can’t be retrieved. “So I think that when the media and the politicians realised ‘too late, too late, this woman is deadly serious, this is not simply a brand, this woman has independent ideas and they are not going to go away’. “They moved very quickly to try to pull it all back, and they used the fact that I was a woman. So they would start to talk about the trivia of it - ‘green MP drinks orange’. “They also never reported in the Guardian or anywhere else what everyone else was wearing,” recalls the one time MP. “And then putting you in a box, redefining who you were. But even within that they created an opportunity for me to build relationships. Bernadette has remained on the hardline fringes of Northern Irish politics since her brief spell in Parliament from 1969 to 1974. She lost her seat when the nationalist vote was split when SDLP stood a candidate against her, allowing John Dunlop of the Vanguard Progressive Unionist Party to win the 1974 general election. Her thoughts? “Did they (the SDLP) use the fact I was a single, unmarried parent to help justify their vote? 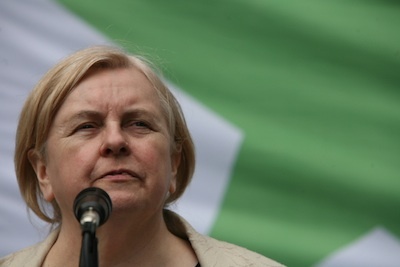 In that same year Bernadette co-founded the Independent Republican Socialist Party (IRSP), set up as a break-away to Sinn Féin, only to leave a short time later. By that time, and in the midst of the Troubles, Bernadette Devlin had become Bernadette Devlin McAliskey after marrying long-term love Michael. Both went onto survive a loyalist assassination attempt in 1981. “I think for people today, giving the whole traumatic times we have lived through, it is often quite difficult for people who aren’t of my age group to have any real understanding of how it all started,” she explains. “Not simply changing with who is telling it, the people who have told their own story have changed how they tell it, as they have gone along. As we have got into the worst part of the conflict, people began to think that all this trouble started with the conflict, so that before, which is a time they didn’t remember, things here were good, and then somehow it all fell apart and we started to behave badly towards each other. Then there was war and violence and that was what created fear and sectarianism and separation and isolation and a whole lot of other things. Her main fear today is for young people, and how they perceive the Troubles, and what the Troubles mean for our future generations. “They only know the story that is given to them,” she tells me. “Whether that’s from dissident loyalists, dissident republicans, from loyalists and republicans now in government, or loyalists and republicans now in positions of community power. “My other biggest fear is that you look at society and you look at the people who aren’t young, I look at the government, I look at the schools, I look at the youth justice system, I look at everything and almost everybody is speaking about our young people as if they were a problem. There is no doubting that Bernadette’s youth played at least a small part in her appeal to those that voted for her in 1969. “I think women voted for me because women were in a very different place and it was incredible to many women that a young woman would stand there and articulate and not have the wit to be afraid of those things,” she says. Bernadette continued: “There’s also a different discussion opened up about that explosion at the time, if that is the word to use, in the sixties of the ‘ism’s’, feminism, socialism. “The sixties was a dramatic period of change for us and in a way if you look around the world today, along the Mediterranean and along Egypt, Syrian and Africa there have been big changes, but it has been very, very difficult. “Because the structures don’t change for young women to have equal access to leadership that young men do, it is difficult. “It is difficult for somebody, a young journalist like yourself, to balance a personal life and that includes children, you will have no choice but to do two jobs for the price of one. “The one you get paid for outside the home and the one you either then do, around that. Two full-time jobs done in the space of one life. And men, don’t. “And I know that young men will say ‘I do this and I do that’, I know what you do. It may be over 40 years since the young Irish Socialist Republican took her seat in Westminster, but her dedication to fighting for the rights of those still on the margins of Ulster society is still as evident as ever. “I can understand why people support their neighbour, but how people stand in the street saying that the Quinn family have been abused against, because they created jobs in some kind of feudal loyalty or exaggerated parochialism, when the evidence clearly suggests, however it happened, that business was taking risks financial risks. “And people can stand there and say ‘poor Sean Quinn is getting a raw deal’. “I have not seen that level of understanding for poor women who have stolen food to feed their children.